This book offers a practical step-by-step guide to being a more successful charismatic leader and achieving extraordinary results from your people. You'll discover the four-step Leadership Charisma Model, how to make a charismatic impression on everyone you meet, how to dramatically increase the impact of your one-on-one communications, how to make your talks and presentations more charismatic, and much more. Charisma is often mistakenly seen as a magical element of someone's personality, write Bud Haney, Jim Sirbasku and Deiric McCann in their book Leadership Charisma. As a result, many people believe that charisma is an attribute: You either have it or you don't. In truth, the authors explain, charisma is a perception by someone else. This insight presents good news for those seeking to be more charismatic. Personalities can rarely be radically changed. Behaviors, on the other hand, can be learned and personal appearance adjusted. The authors present a four-step model designed to help people learn how to be charismatic. Only the last three steps involve in-depth advice and specific how-to guidelines, however. The first step is to make a commitment to learn the behaviors that define charisma. Once a leader makes a commitment to learn what it takes to be charismatic, the next step, according to the authors, is to build the foundation of charisma, which is solid, unwavering self-confidence. How do you build self-confidence? First, the authors suggest, always live in the present. Setting compelling goals helps leaders focus on what they need to be doing today. Self-confidence is also built through visualizing success. Since the brain doesn't distinguish between the real and the imagined events, vivid visualization can have powerful effects. The third step in becoming a charismatic leader, according to the authors, is to fine tune your physical charisma. Much of what conveys charisma is physical — how leaders carry themselves, how they smile, how they look at those to whom they're talking. Even simple gestures can have profound effects. Research shows that steepling your fingers indicates high confidence in what you are saying. Gestures to avoid include putting your hand over your mouth (are you lying?) and putting your hands behind your back (sending a strong "stay clear, I don't want to engage with you" message). The fourth step in developing charisma is to pull together all the critical attitudes and behaviors of leadership into a charismatic persona. The authors' advice in this fourth step ranges from preparatory steps, to specific behaviors (be contagiously energetic and enthusiastic), to a positive and generous mindset. As with building and displaying self-confidence (step 2) and mastering the physical facet of charisma (step 3), the authors offer specific how-to checklists and guidelines to help readers develop their charismatic persona. To communicate with charisma, for example, leaders should: keep it upbeat; solicit ideas from others; be straightforward, even when dealing with sensitive subjects; and create a comfortable climate for raising concerns. 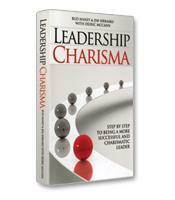 Carefully organized and clearly written, Leadership Charisma is an engaging manual on charisma. A graphically innovative design that includes color-coded chapters and icon-coded boxes adds to the book's appeal. Leadership Charisma is also based on extensive research — including surveys of 400,000 people who were asked to rate the charisma of their 40,000 leaders — conducted by the authors' company Profiles International (co-founded by Haney and Sirbasku). 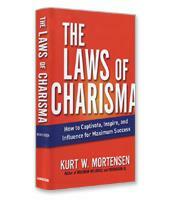 Easy to read and consult, this is a good title for leaders who struggle with charisma to keep near their desks.